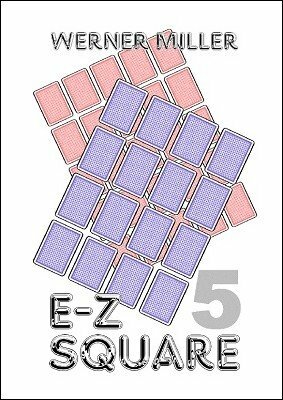 The spectator decides on a number, and you produce instantly a magic square that has the spectator's number as its constant – simply by dealing out 16 or 25 ordinary playing cards. Each number of the square is represented by a single card's value. There are more cells to be filled than different values in a deck, so it is impossible to use each value only once; but because all duplicates differ in suits, they hardly catch one's eye. Non-card players are sometimes not familiar with the values usually assigned to the court cards. To avoid any confusion, only spot cards are used; their values are quite obvious (number of spots), and the resulting constant of the square is small enough to do all the summing up fast and without electronic aids. The fact that Miller's methods only require regular playing cards means you are ready to perform anywhere a deck of cards is available. You will find three variations and a bonus item from one of his earlier ebooks. 1st edition 2013; 18 pages.